By Carol Tallon, Head of PropertyDistrict.ie – Originally published in the Irish Examiner newspaper. There is a relatively new sector within the property industry globally referred to as ‘proptech’. This term is used to describe a whole host of new technologies that are specifically designed or adapted and then applied to address issues affecting the buying, selling, renting and maintaining of property. Greater efficiencies for professionals was certainly an early driver, however, in recent years we have seen smart homes evolve into smart cities, robotics being used on construction sites and buildings being manufactured offsite. Virtual reality and augmented reality 3D tours have allowed buyers of new homes the experience of walking through their fully decorated new house or apartment before it is even built. It is fair to say that property marketing will never be the same again. While it is not widespread, a small number of homes have now been transferred via blockchain technology and, in the UK, cryptocurrencies have been accepted in discharge of the contract price for a new home. The sheer pace of the innovation in this area is unprecedented. In the Irish marketplace, online bidding platforms have become the norm for property auctions in recent years, however, the industry has been slow to transform the traditional process for private treaty sales, despites its obvious shortcomings. Where change is happening, it appears to be consumer-driven. Property consumers are changing how they search for properties, apply for mortgages, book viewings and make bids – do traditional estate agents have the capacity, or the will, to meet and get out ahead of these changes? Healy Hynes, founder of Beagel.io, is one of the few proptech innovators to bring more than two decades of industry experience to the disruption table, having managed the family property business for 20 years. His interest in technology for the property market is not a new one, having built websites for estate agents in the late 1990s and established a new homes digital marketing division within the business back in the early 2000’s. “New homes is a fascinating market, it operates in a very different dynamic to the second-hand marketplace. It’s drivers are different, it’s buyers are different, it’s decision-makers are different. The Irish new homes market is a sleeping giant that is only now waking up” he prophesises. Another of the sector’s early innovators, co-founder and CEO of Property Button Jim Urell, has recently launched the company’s ‘Moving’ platform, which helps property agents to identify the right tenants and move them into suitable properties quickly and efficiently. This is particularly relevant given the rental crisis in most urban centres in Ireland right now and the difficulties experienced by would-be tenants . Significantly, access to ‘Moving’ is free for tenants; they can sign up and create their GDPR-compliant Tenant Profile, which gives them the opportunity to demonstrate why they would be the right choice for a property. There is also a facility to set up notifications of other suitable properties locally and within budget. The greatest benefit for tenants however, is that this profile moves with them from one rental property to the next, until they are ready to buy a home of their own. At that stage, the platform can be used to support a mortgage application, showing a credible rental history and establishing affordability. It is akin to a social networking site like LinkedIn that can be used at every stage of the property journey. 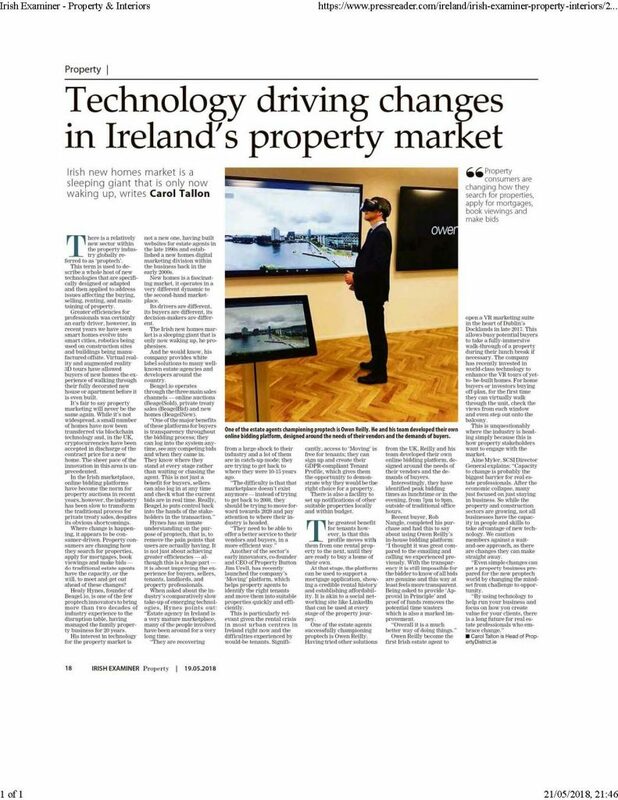 Owen Reilly become the first Irish estate agent to open a VR marketing suite in the heart of Dublin’s Docklands in late 2017. This allows busy potential buyers to take a fully-immersive walk-through of a property during their lunch break if necessary. The company has recently invested in world-class technology to enhance the VR tours of yet-to-be-built homes. For home buyers or investors buying off-plan, for the first time they can virtually walk through the unit, check the views from each window and even step out onto the balcony.